You’re welcome for getting that catchy little tune in your head for the remainder of the evening. 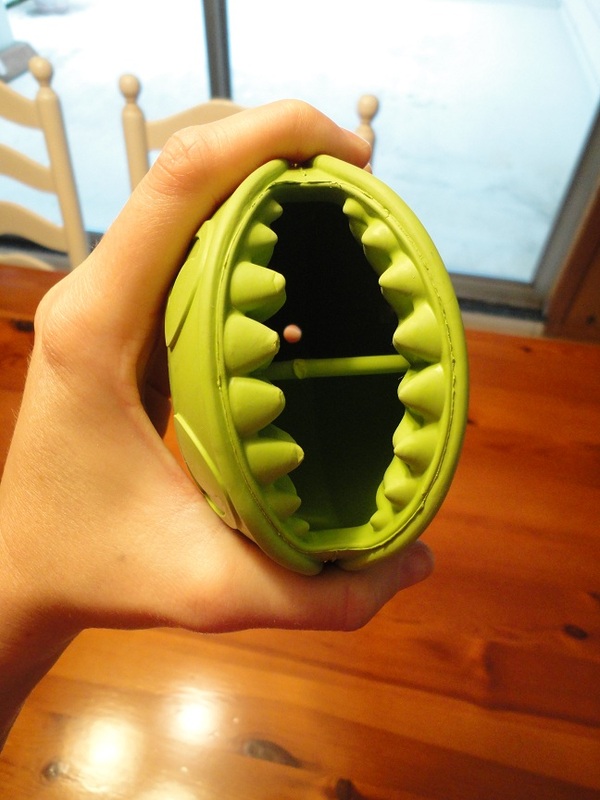 Check out the Jolly Pets Monster Mouth! 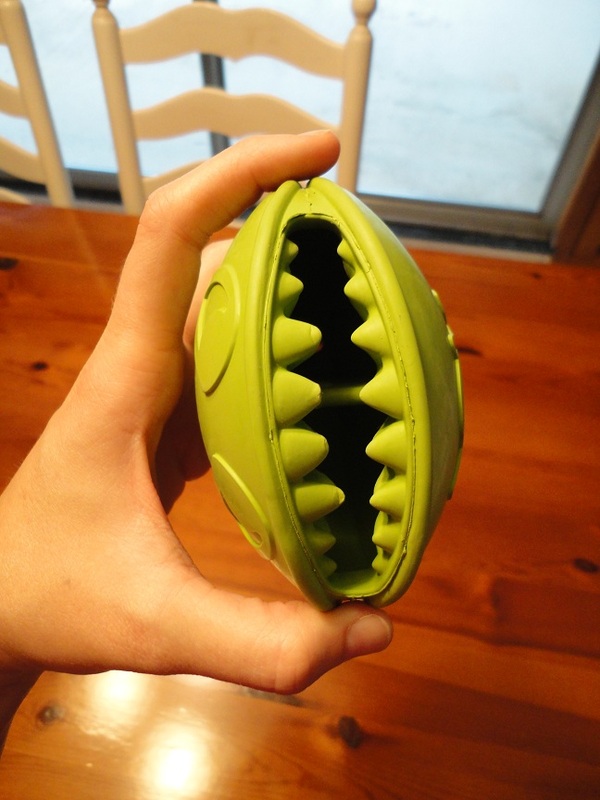 The Monster Mouth is an interactive treat toy made from non-toxic rubber. 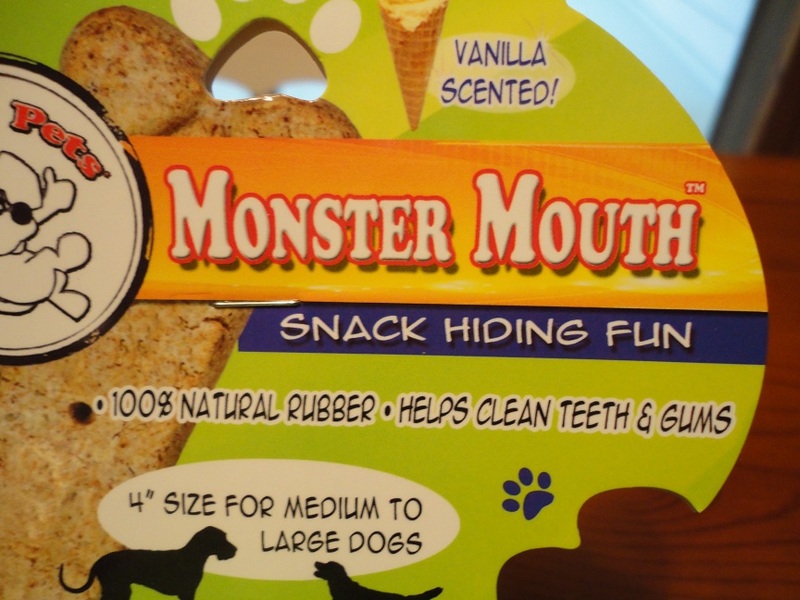 I’m not quite sure the Monster Mouth is vanilla scented because Teton didn’t seem to care much, but I guess the “vanilla” scent sorta covered up the strong smell of the rubber, which is a plus. The MM (which I snagged for $10 at Tarjay) is a unique interactive treat toy because unlike the Contempo Tessa and Twist ‘N Treat, it’s meant to be chewed on. 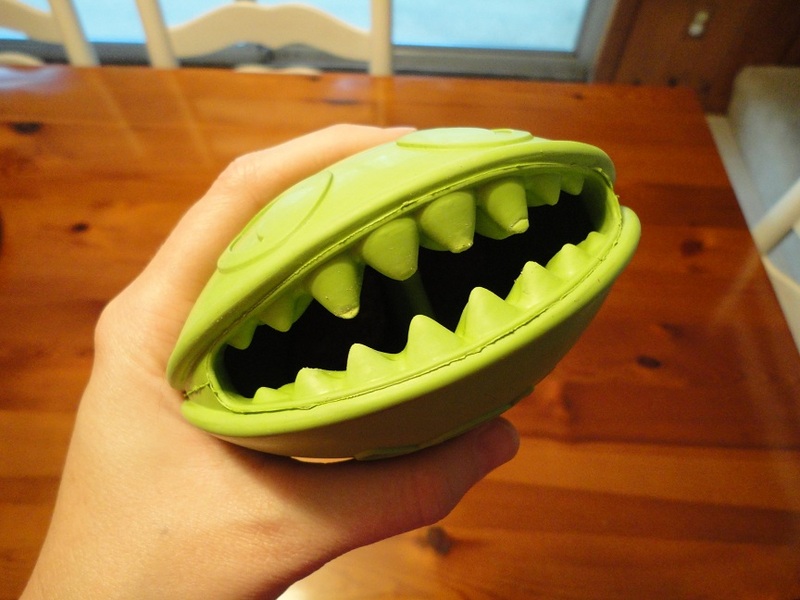 The only way to get treats out of the Monster Mouth is to, well…let me show you! 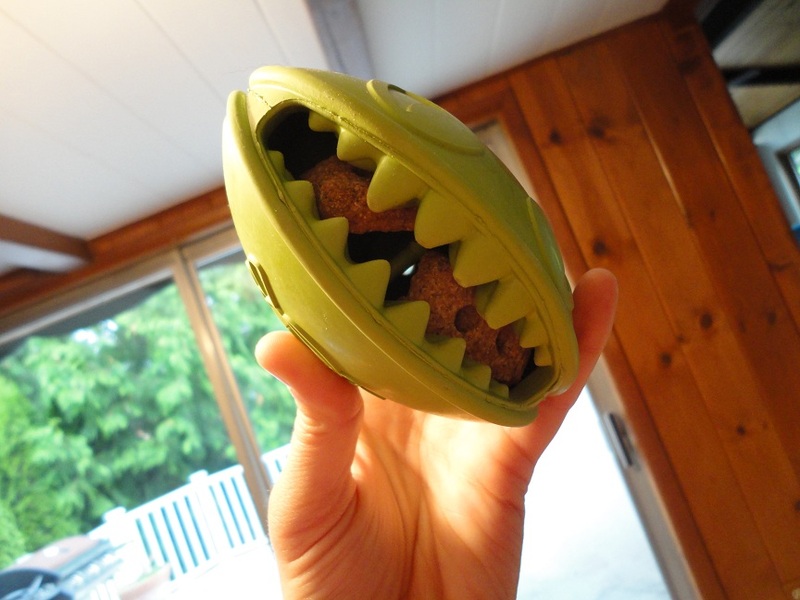 Once treats have been stuffed into the monster’s mouth, your dog must squeeze the toy open on its sides in order to pull or dump the treats out. 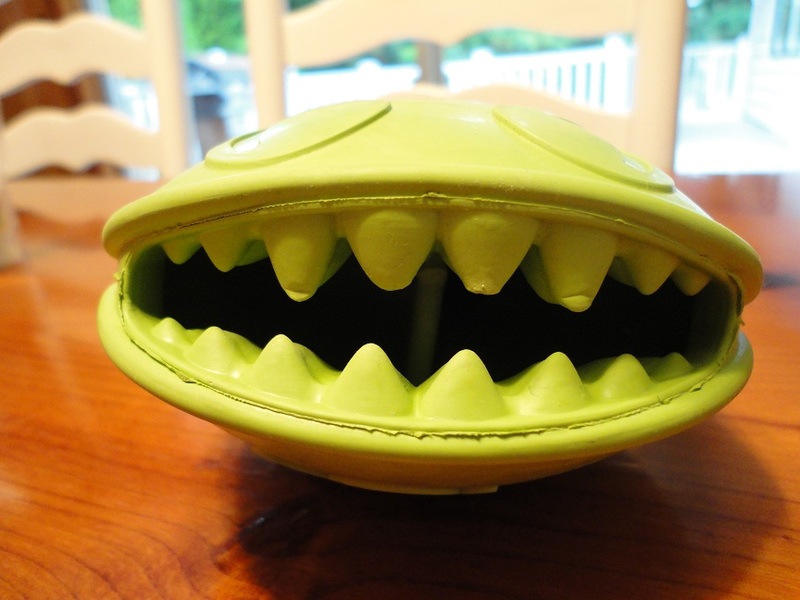 We gave the Monster Mouth some Holistix for our first go around. They’re in there. I promise. After the treats were in the mouth of the monster, I became skeptical. It was a little hard for me to squeeze open the monster’s mouth with one hand while I snapped a photo with the other hand, so wouldn’t it be much too hard for Teton to squeeze it open, too? I’m sad to report that, after 30 minutes of this, The Little Blogger gave up. He tried his hardest but those darn treats just weren’t coming out! I think the reason the Monster Mouth hasn’t worked yet for Teton is two-fold. 1) Teton is used to interactive treat toys that require him to use his nose and paws to push a device around in order for treats to fall out. 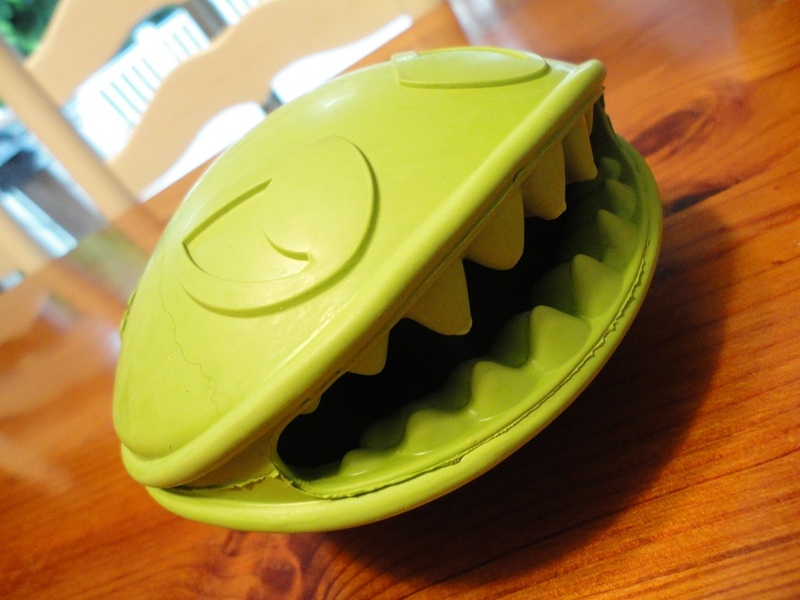 Much of the behavior that he displayed while using the Monster Mouth was similar to his behavior when using the Contempo Tessa. The only difference is that with the Monster Mouth he was laying down and using his mouth to try to remove the treats. 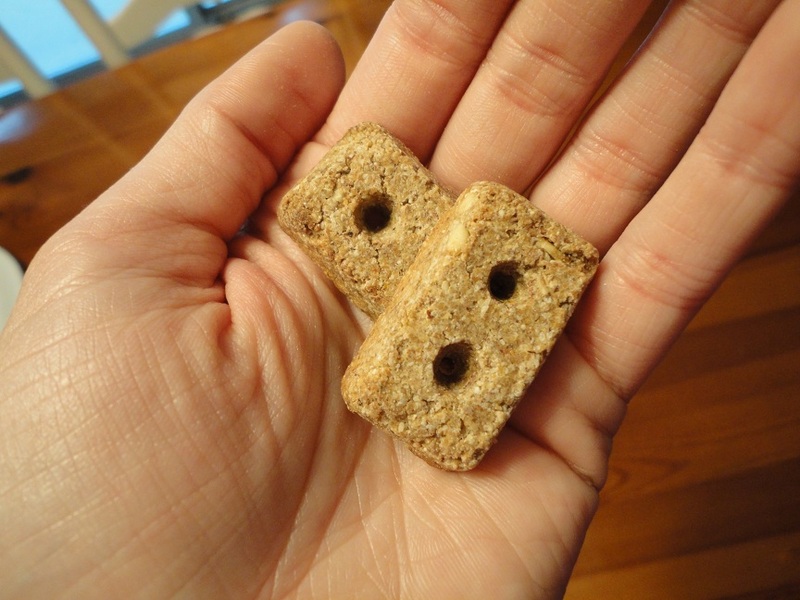 2) The treats that we used did not protrude from the mouth of the monster. Thus, they were nearly impossible to get a hold of. 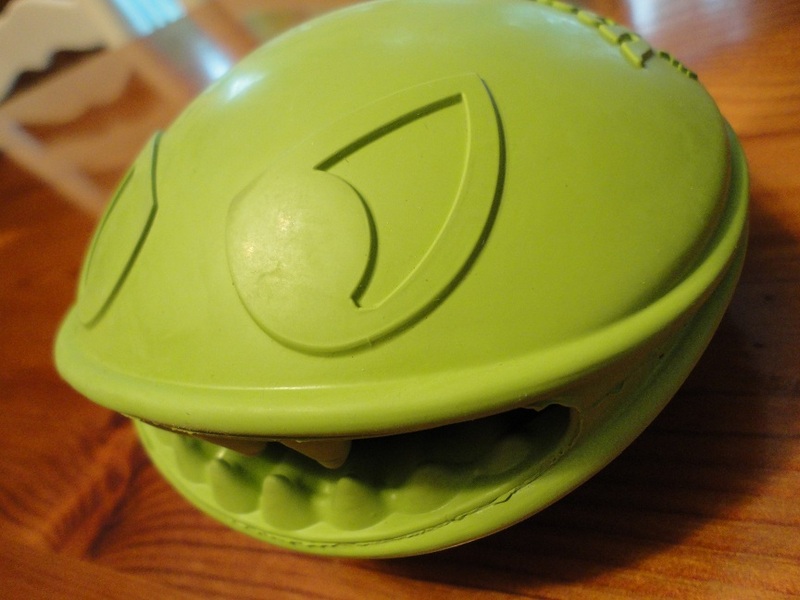 I don’t know if this is a valid reason that the Monster Mouth didn’t work for Teton, but I think it probably would have been smarter to use large treats that protruded from the mouth of the monster for The Little Blogger’s first introduction to the toy. That way, he would have been rewarded quicker and motivated to work through a more difficult challenge the next time around. The Monster Mouth hasn’t worked for us yet, but we’ll keep trying. 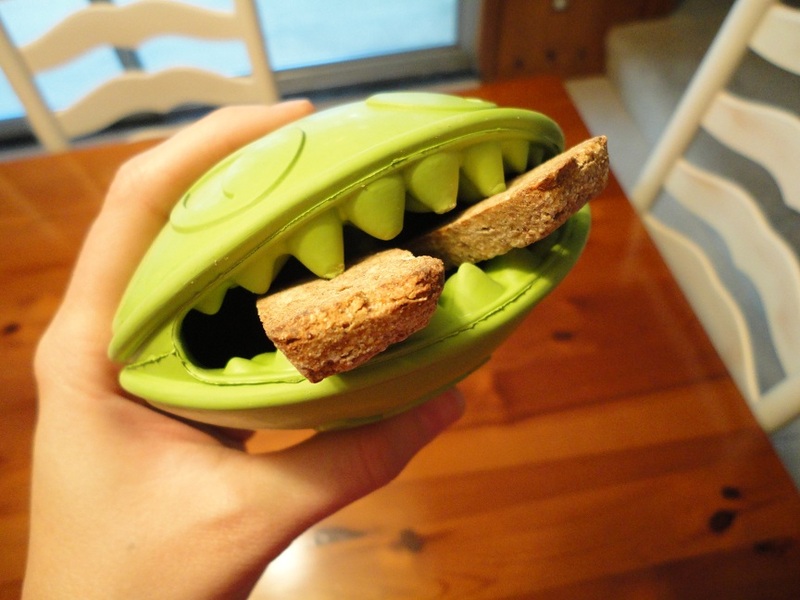 Perhaps a little peanut butter smeared around the monster’s teeth (in addition to a larger treat inside the monster’s mouth) will do the trick! We’re off to do a little craft project in preparation for the weekend. Remember what’s happening?! Posted on July 7, 2011 July 7, 2011 by Shannon	This entry was posted in Toy Chest, Treat Jar. Bookmark the permalink.